Is swing your thing? Do the hallowed days of disco bring back memories? Have you always wanted to learn how to Mambo? 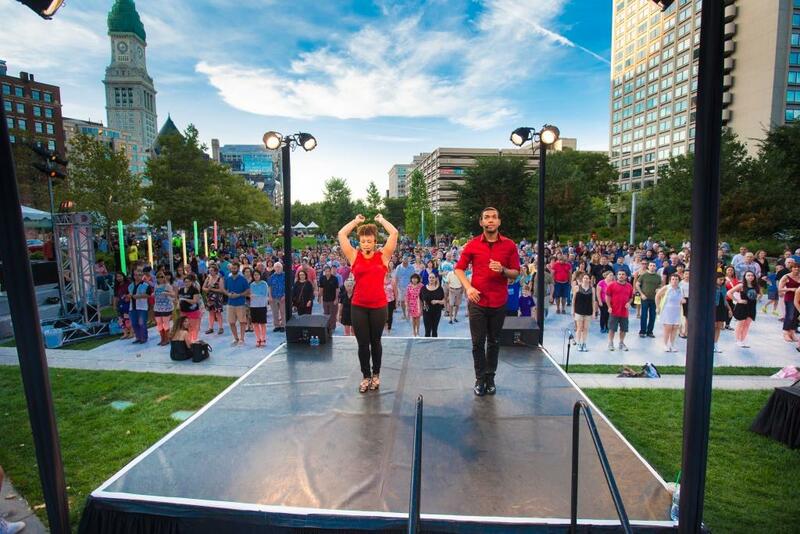 The Celebrity Series of Boston invites dancers of all ages and abilities to grab their dancing shoes and head to the Rose Kennedy Greenway September 13-17, 2017 for the return of Let’s Dance Boston. Let’s Dance Boston is a free, five-day dance and live music extravaganza, taking place at Dewey Square Park on The Greenway. Each event features a different style of dance along with a live band preceded by expert dance instructors. Each session begins with a 45-minute free dance lesson taught by professional teachers in the dance style of the evening. After the dance lesson, a live band performs a 90-minute set to accompany the dancing and continue the party. On Wednesday, September 13, it’s all about Swing with Michael Gamble and the Rhythm Serenaders, featuring Laura Windley. From the Lindy Hop to the Charleston, there is a vibrancy and excitement to Swing that will be evident as Michael Gamble and the Rhythm Serenaders, featuring Laura Windley, take the stage. This hard-swinging and stylistically faithful ensemble, created in the mold of the late 1930s, early 1940s dance band, performs arrangements popularized by bands led by Fletcher Henderson, the Coleman Hawkins All Stars, various Duke Ellington and Lionel Hampton side groups, the Dickie Wells and Willie Bryant orchestras, and more. The evening starts with a dance lesson from local teachers and choreographers Katie and Paolo Piselli, who bring more than 15 years of experience in social dancing to the dance floor. 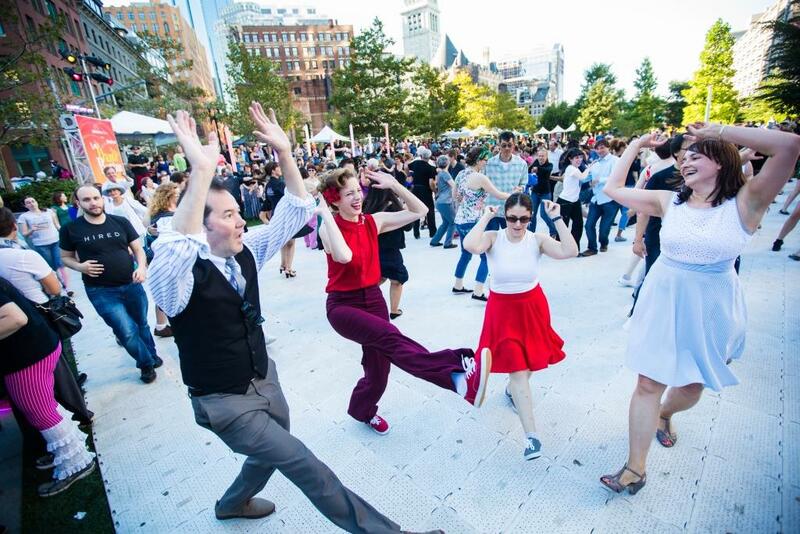 Havana comes to The Greenway with the fast-paced, Latin dance moves of the Mambo accompanied by the high-voltage celebration of Latin music from Tito Puente, Jr. and His Orchestra. Puente, Jr. is determined to nurture the musical legacy left by his father, Tito Puente, revered by many as “Mambo King”. The evening begins with a lesson in the basic moves of Mambo from Ana Masacote, an international ambassador of Latin dance who has been profiled in La Voz del Mambo magazine as “The Future of Mambo” and Gastrell Rossignol, a Latin dance instructor. 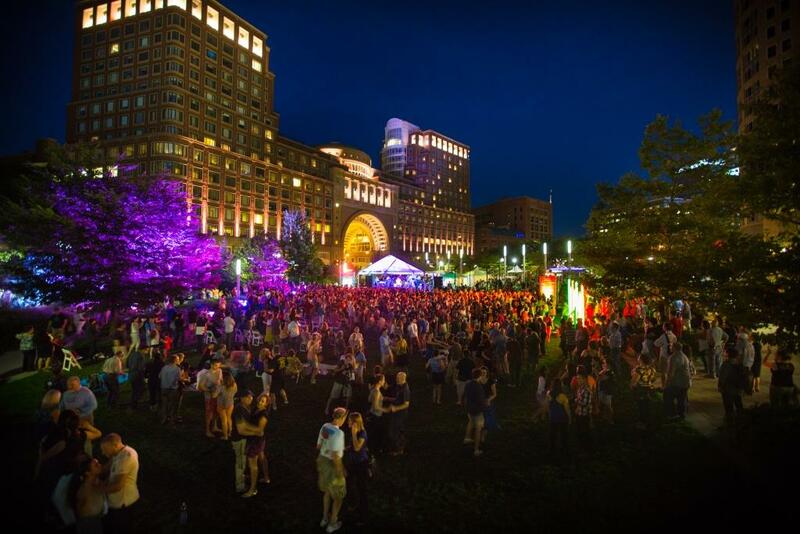 Hustle down to Dewey Square Park on Friday, September 15 for a ‘70s Disco Party with The Loser’s Lounge, a collective of New York City’s finest performers founded in 1993 by former Psychedelic Furs keyboardist Joe McGinty. You bring the moves, they’ll bring all the greatest hits of the ‘60s, ‘70s and ‘80s. Award-winning performance coach and choreographer Rob Glover will start the evening by sharing the basic partner steps of the classic disco dance, the Hustle. Dust off your best disco suits and dresses and bring the sparkle down to The Greenway. Saturday, September 16 is Salsa time with Orquesta SCC “La Excelencia”! The fun continues on Saturday, September 16, with the spicy sounds of Orquesta SCC “La Excelencia”, a salsa dura orchestra based in New York City. This contemporary 11-piece big band is world-renowned for breaking from many unnecessary traditions in order to recreate the genuine Latin style and sound in a manner that befits the modern era of music. Spicy sounds require hot moves, and Jenna Robey and Luis Talavera Diaz, Latin dance instructors from Malden, Mass., will share the basics of Salsa. Robey recently placed first with her Salsa team at the World Salsa Summit. Let’s Dance Boston concludes with an afternoon of Klezmer, offered in association with the Jewish Arts Collaborative. The day features the sounds of Alicia Svigals’ Klezmer Fiddle Express, led by composer/violinist/vocalist Alicia Svigals, the world’s leading klezmer fiddler and a founder of the Grammy-winning Klezmatics. The afternoon begins with instruction from Steve Weintraub, an internationally-known teacher of traditional Yiddish Dance who trained with Alvin Ailey and Erick Hawkins. Known as the “Pied Piper of Yiddish Dance”, Weintraub has led workshops around the world, performing in places such as Krakow, Paris and Weimar. Let’s Dance Boston is sponsored by Leslie & Howard Appley, Amy & Joshua Boger, Stephanie L. Brown Foundation, Donna & Mike Egan, and Eleanor & Frank Pao. Additional support is provided by the Barr Foundation. The Celebrity Series of Boston, Inc. receives generous support from Leslie & Howard Appleby, Amy & Joshua Boger, the Barr Foundation, the Boston Cultural Council, The Boston Foundation, the Stephanie L. Brown Foundation, Susanne Marcus Collins Foundation, Deloitte LLP, Donna & Mike Egan, Foley & Lardner LLP, the French-US Exchange in Dance, Gabor Garai & Susan Pravda, David & Harriet Griesinger, Zachary Haroutunian and the Garbis & Arminé Barsoumian Charitable Foundation, Paul L. King, the Liberty Mutual Foundation, the Massachusetts Cultural Council, the National Endowment for the Arts, Eleanor & Frank Pao, The Peabody Foundation, the Cynthia and John S. Reed Foundation, the Royal Little Family Foundation, the Stifler Family Foundation, Mrs. Belinda Herrera Termeer, Michael and Susan Thonis, Tufts Health Plan, Nancy Richmond Winsten, Anonymous, and many others. The Rose Kennedy Greenway, a roof garden atop a highway tunnel, is a contemporary public park in the heart of Boston. The non-profit Greenway Conservancy maintains, programs, finances, and improves the 1.5-mile Greenway on behalf of the public. The Greenway welcomed 1,379,000 trackable visitors in 2016, and the Conservancy has won numerous awards for organic landscape care, public art, and programming.